In a rigid matrix at low temperature, a single molecule presents one intense and very narrow absorption line, called zero-phonon line. Its spectral position is shifted randomly by defects in the environment of the molecule. Such sharp spectral features open many experiments in quantum optics, molecular spectroscopy, and nanoscale probing. In this project, we wish to probe charge injection and conduction on nanometer scales in an organic material. 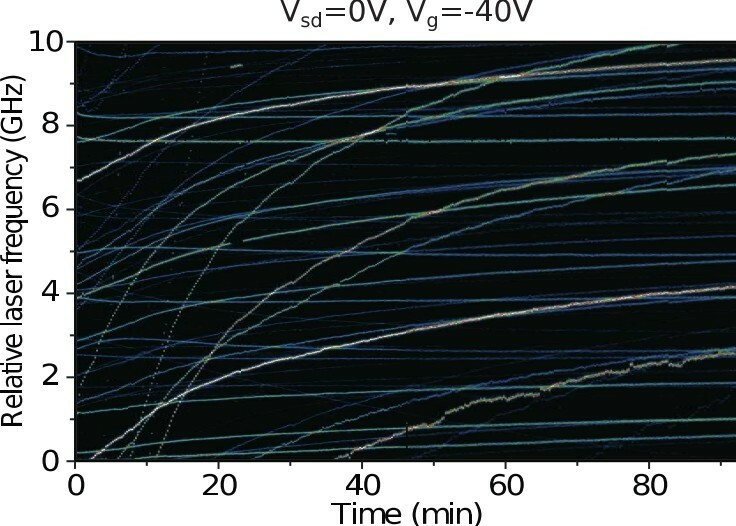 After charge injection, new local electric fields are created in the material and can dynamically shift the spectral positions of individual molecules by linear and quadratic Stark effect. The spectral traces of single molecules show a rich variety of complex behaviors. The non-exponential relaxation of the lines indicates a slow relaxation of the charge distribution. The noisy apparence of the spectral diffusion in some cases indicates possible instabilities in the current flow, felt differently by different molecules, depending on their positions. The spectral selection of up to thousands of molecules in each focal spot makes it possible to obtain sub-wavelength resolution in the study of these effects, for example in the interaction of molecules with metallic electrodes or nanostructures. Our favorite system for these studies is a thin anthracene crystal doped with fluorescent dibenzoterrylene molecules which present two main absorption sites at 785 and 795 nm. Fig.1 Spectral traces of the zero-phonon lines of a large number of dibenzoterrylene (DBT) molecules in an anthracene crystal. This crystal, kept in superfluid helium at 1.4 K, is the organic conductor acting in a field-effect transistor structure. Source and gate voltages are applied with gold electrodes and a doped silicon substrate. The horizontal axis gives the time elapsed since switching on the gate voltage from Vg=0V to Vg=-40V at time t=0. The slow relaxation of molecular lines is attributed to relaxation of a charge distribution injected into the material by the high applied voltage at the electrodes of the FET. Besides a global trend of a slow, non-exponential relaxation, a more detailed look reveals heterogeneous behavior, with striking differences from molecule to molecule. For example, some traces show strong noise, whereas one of them shows a reversible spectral jump.